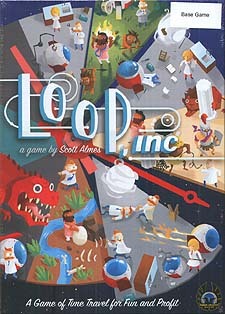 You and the other players work at Loop Incorporated, the most prestigious time travel agency in the world. Well, that's not entirely true. It's a mismanaged, third-tier agency owned by the slick Mr. Loop, who cares more about making a buck than making sure the delicate weave of the time-space continuum stays tight and safe. For you and your coworkers, it's as good a job as any, and if you time things just right you may even get a nice bonus at the end of the day. And since you have a time machine, you can take multiple cracks at it...assuming things don't get too chaotic with your past selves running around.